Passionate hatreds can give meaning and purpose to an empty life. These people haunted by the purposelessness of their lives try to find a new content not only by dedicating themselves to a holy cause but also by nursing a fanatical grievance. A mass movement offers them unlimited opportunies for battle. Crude absurdities, trivial nonsense, and sublime truths are equally potent in readying people for self-sacrifice if they are accepted as the sole, eternal truth. New Updates! (4/22/2019) We've been working really hard on completing our membership system so you can submit quotes and keep track of them. Once this is complete in the coming weeks there will be a lot more quotes by Eric Hoffer and other authors. 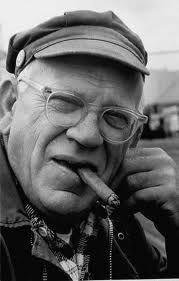 We've also changed the sorting on the site so you now see the latest Eric Hoffer quotes first. Our goal is to have the best Eric Hoffer quotes on the web!